Our dedicated in-house aftersales team are on hand to make the process of buying your dream property stress-free and will guide you through every stage of the process. From arranging your NIE Number application and signing the reservation contract (usually 5000€) to providing inventory's, assisting with translation, and accompanying you to the Notary on the day of completion, we endeavour to make the entire process hassle free. The initial deposit is normally held within the account of the vendor's solicitor, which is then shown by receipt in the form of a factura or bank slip provided on the day of completion. Should there be any legal issues with the property, the deposit is fully refundable. Once the reservation contract has been signed our team can then liaise between both parties on all matters associated with the sale, including Mortgages, Money Transfers, Insurance, Furnishings, Solicitors, Banks, Removals etc. 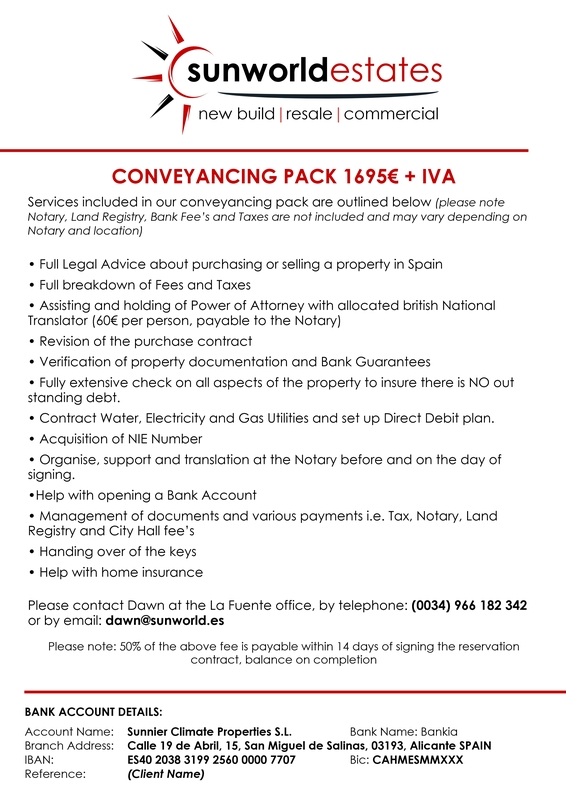 A member of the team will also accompany you to the Notary on the day of completion where the balance of the purchase money is paid and the official deeds are signed over in to your name. The Spanish Notary is where public officials play a neutral role in the drafting and witnessing of a range of contracts. The Notary is there to ensure that both parties reach agreement and understand all the terms and conditions associated with the contract. They are also there to witness that no terms in the contract contravene Spanish law.